A colleague at work told me there were owls in this provincial park and gave directions on where to find ’em. After wandering around staring into the trees for a half hour, I finally spotted this beauty in a giant cottonwood. I was fortunate to have a reasonably long telephoto lens to use on my Nikon D90. 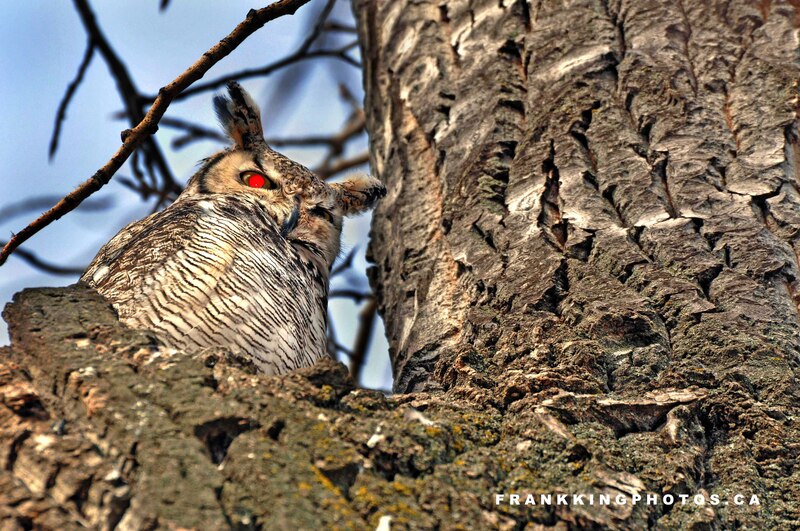 I put the camera on a tripod then clicked away, using fill-flash to brighten the owl against the background. It was the fill-flash that created the red eye. I have a corrected version, but this one seems so much more evocative. Owl shot has been on my to do list for a while. I’m jealous. 🙂 Great image.